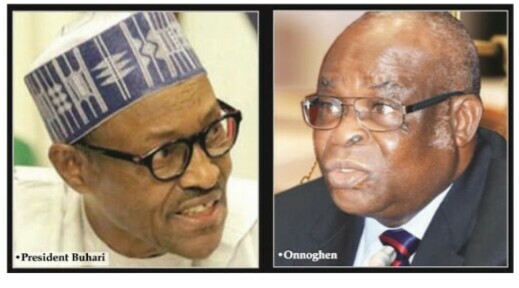 Relyng on an order of a Code of Conduct Tribunal (CCT) which was asked to stay action on the case, President Muhammadu Buhari yesterday suspended the embattled Chief Justice of Nigeria (CJN), Justice Walter Onnoghen and immediately swore in an acting CJN. He is Justice Ibrahim Tanko Mohammed, next in ranking at the Supreme Court. Justice Mohammed was conveyed to the Presidential Villa at about 4:30pm in a black Mercedes Benz C240 with number plate GWA:900FA. 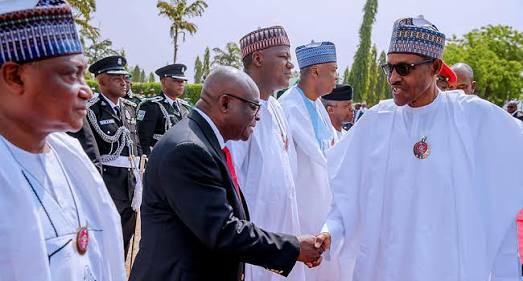 Buhari,in a 20-paragraph speech soon after swearing in the acting CJN, decried “the drama around the trial of the Chief Justice of Nigeria,” which he said, “has challenged that pillar of justice in the perception of the ordinary man on the street.” He said government could not allow the situation to continue unabated. His words: “A short while ago, I was served with an Order of the Code of Conduct Tribunal issued on Wednesday 23rd January 2019, directing the suspension of the Chief Justice of Nigeria, Honourable Justice Walter Nkanu Samuel Onnoghen from office the pending final determination of the cases against him at the Code of Conduct Tribunal and several other fora relating to his alleged breach of the Code of Conduct for Public Officers. “The nation has been gripped by the tragic realities of no less a personality than the Chief Justice of Nigeria himself becoming the accused person in a corruption trial since details of the petition against him by a Civil Society Organisation first became public about a fortnight ago. “Perhaps more worrisome is the Chief Justice of Nigeria’s own written admission to the charges that he indeed failed to follow the spirit and letter of the law in declaring his assets, citing ’’mistake’’ and ’"forgetfulness,’’ which are totally unknown to our laws as defences in the circumstances of his case. “One expected that with his moral authority so wounded by these serious charges of corruption, more so by his own written admission, Mr. Justice Walter Onnoghen would have acted swiftly to spare our Judicial Arm further disrepute by removing himself from superintending over it while his trial lasted. “Not only the trial court, but others have been put on the spot. Practically, every other day since his trial commenced, the nation has witnessed various courts granting orders and counter-orders in favour of the Chief Justice of Nigeria, all of them characterised by an unholy alacrity between the time of filing, hearing and delivery of judgment in same. “The real effect has been a stalling of the trial of Justice Onnoghen, helped along by lawyers who insist that these orders, whether right or wrong, are technically valid, and must be obeyed till an appellate court says otherwise. No doubt, that it is the proper interpretation, but is it the right disposition for our nation? “As you are all aware, the fight against corruption is one of the tripods of policies promised to Nigerians by this administration. Needless to say that it is an existential policy which must be given adequate attention and commitment by all the three arms of government. The efforts of the Executive will amount to nothing without the cooperation of the Legislature and especially the Judiciary. “It is against this background that I have received the Order of the Code of Conduct Tribunal directing me to suspend the Chief Justice pending final determination of the cases against him. It also explains why I am not only complying immediately, but with some degree of relief for the battered sensibilities of ordinary Nigerians whose patience must have become severely over-taxed by these anomalies. “In line with this administration’s avowed respect for the Rule of Law, I have wholeheartedly obeyed the Order of the Code of Conduct Tribunal,dated 23rd Janu ary 2019. “Accordingly, I hereby suspend the Honourable Mr. Justice Walter Nkanu Samuel Onnoghen, GCON, as the Chief Justice of Nigeria pending final determination of the case against him at the Code of Conduct Tribunal. “In further compliance with the same Order of the Code of Conduct Tribunal, I hereby invite Honourable Justice Ibrahim Tanko Mohammed, JSC, being the next most Senior Justice in the Supreme Court, to come forward to take the Judicial Oath as Chief Justice of Nigeria in an Acting Capacity.